The Pitch: Saved By The Scream: The College Years. The Review: Who are the greatest animation house ever to have made motion pictures? Most people answering that question would likely say Disney, and the evidence would support that – to a point. If you look at the Internet Movie Database Top 250 Films list (as I frequently do), there are currently 17 animations among those 250 films. Nine of them bear the stamp of the fairytale castle at the beginning, but only two were old school Disney (Beauty And The Beast and The Lion King, in case you were wondering). The other seven – Toy Storys 1 and 3, Up, Wall•E, Ratatouille, Finding Nemo and Monsters, Inc. – all share the castle opening with that of an anglepoise lamp jumping on a letter. (Quiz question for you – can you name the other eight, non-Disney movies? Answer at the bottom.) Pixar has become so synonymous with not only quality, but outstanding quality of both animation and storytelling, that the expectation on every film they make is almost inevitably going to prefix disappointment. Movies such as the Cars films, and to a certain extent Brave, would have felt perfectly acceptable, even decent, from other studios, but from Pixar they feel missed opportunities, so high has the bar been raised. Now, the studio seems intent on mining its back catalogue, buoyed by the success of Toy Story sequels and now set to find more fish (in the upcoming Finding Dory) and to scare more monsters. But did the world really need a prequel to Monsters, Inc.? It feels an incredibly safe storytelling decision from a studio renowned for narrative bravery, not least because the various endings of Monsters, Inc. would seem to preclude any sensible sequel without diminishing the magic of the original. So we’re presented with what, for a decent length of the run time, is about as predictable an American college / fraternity movie as you could possibly imagine. Inspired by a school visit to the local scaring company, Mike Wazowski (Billy Crystal) dreams of becoming a top scarer. Pursuing this dream all the way to college to major in scaring, Mike meets many of the familiar faces we’ll know from his future, including his friendly roommate Randall (Steve Buscemi) and the arrogant jock monster James P. “Sulley” Sullivan (John Goodman). They are all in fear of the university’s ominous Dean Hardscrabble (Helen Mirren), and when Mike and Sulley inadvertently upset the dean, they both end up off the Scare Program. The only way back in looks to be an alliance with the dorkiest fraternity on campus, Oozma Kappa, and somehow getting them in shape to win the college’s Scare Games. There are very few points anywhere in the duration of Monsters University where you get the feeling that this was a story that needed to be told. Where most Pixar feels fresh, vibrant and can often move you to tears, the only tears here will be those of frustration during the opening stretches when the laughs seem to have been scared off and the monsters are playing out the plot in the most predictable way possible. There’s a few reasonable gags, but it’s not until the movie reaches the Scare Games that the laughs start flowing thick and fast. 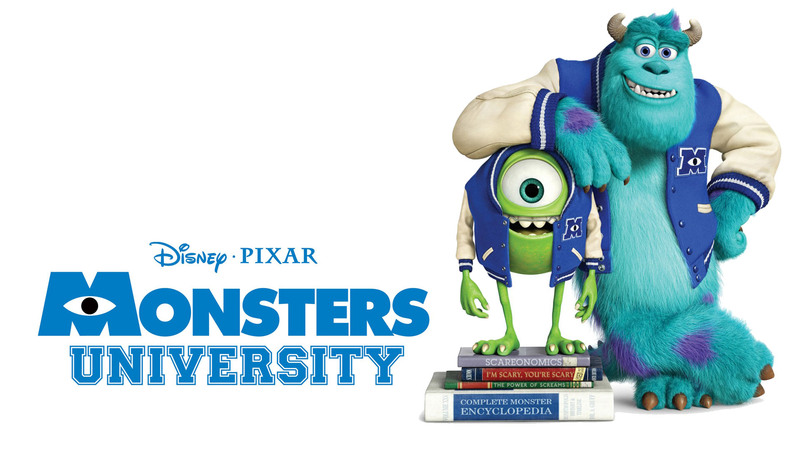 This is a relief, as it’s then easier to overlook the predictability of the plot – which may as well be on rails, so predestined does it seem on its course – and to enjoy Monsters University for what it is, which is a decent amount of fun from that second act onwards. All of the returning voices, from Crystal to Goodman via a fair few background monsters in a variety of fun cameos dotted liberally through the run time, fit snugly back into their original roles but some of the new characters are less successful. While the likes of Nathan Fillion and Aubrey Plaza fill out the background well, the weakest link might just be Helen Mirren as the dean, simply for the fact that she’s just being Helen Mirren being a monster, and it never feels quite enough for her character. Of course, this Pixar movie – as with every other Pixar movie – still manages to look gorgeous, achieving a strange mix of almost photorealism mixed with cartoon monsters, but every frame is a visual feast. What the original had in spades, as do most Pixar movies, were a level of invention and surprise that would feed ten other normal movies; the climax, with the chase through the realm of doors, can’t quite be matched here, but a smaller scale finale is almost as effective, favouring atmosphere over spectacle and still satisfying as a resolution. The last stretch of the film feels the most genuinely Pixar, where the plot doesn’t always go where you’d quite expect and where the character beats manage to strike just the right notes. The real problem with Pixar is the rod they’ve made for their own back with such a sustained period of immaculate quality, but it would be wrong to feel hard done by with a good Pixar movie instead of a great one, when their good still manages to outdo the great of almost everyone else. But, while the Toy Story movies managed to feel necessary for their characters, Monsters University is more disposable; let’s just hope this studio learns when to stop going to the well before it’s too late. Why see it at the cinema: It’s a Pixar movie, so of course it’s packed with rich and incidental detail, so while you won’t have the luxury of a pause button, you will be able to pick out a decent number of the tiny and obscure references in the background thanks to the cinema screen. Also, the second and third acts have a high level of laughs, comparable to the original, and that always works better with an audience. Why see it in 3D: It’s a tricky one: there’s nothing offensive about the 3D, but nothing compelling about it either. It adds depth of vision, but there’s none of the minions-in-your-face malarkey of Despicable Me 2, its likely box office competition in the UK this summer. The best I can say is if that you’re not paying a significant 3D premium, don’t mind the glasses and can’t find a 2D screening, then the 3D is perfectly watchable. What about the rating: Rated U for mild slapstick and comic threat, meaning anyone over the age of four can see this, with or without parents. And you all should. Answer to the earlier quiz question: The eight non-Disney produced or distributed movies in the IMDb Top 250 at the time of writing are Spirited Away, My Neighbour Totoro, Grave Of The Fireflies, Princess Mononoke, Nausicaa Of The Valley Of The Wind and Howl’s Moving Castle (all Studio Ghibli), How To Train Your Dragon (Dreamworks) and Mary And Max (Melodrama Pictures). If you got them all, then you obviously cheated. Shame on you. This entry was posted in Reviews and tagged 2013, Billy Crystal, film, Helen Mirren, John Goodman, Monsters University, movies, Pixar, review. The Review: Sat here, trying to find words for The Artist, feels like the world’s biggest irony. I write this review a couple of days after much has been made in the news of people walking out in a screening in Liverpool after not realising what they’d let themselves in for. Cinema has been evoking strong reactions in people ever since the Lumière brothers first charged people to sit and watch pictures moving on a wall over 115 years ago, and competition ever since from upstarts such as radio, television and the internet have caused cinema to attempt to innovate. Sound, colour, wide screens and even 3D have come and stayed over the years, so the idea of watching a film that abandons all of those concepts seems to be deliberately obtuse, clinging sentimentally to past glories without being willing to innovate. But the techniques of cinema worked successfully through all of those early years, and it wasn’t that cinema was evolving as it had exhausted all of its possible uses for the latest fads; it was evolving to survive. So if you’re going to make a film in black and white, without dialogue, in the Academy ratio (1.37:1, closer to an old cathode ray tube TV than the widescreen LCDs of today), then what better subject to take than that loss of innocence and the passing of one of the first great eras of the medium? George Valentin (Jean Dujardin) is a star of the silver screen, but when talkies come round, he’s reluctant to embrace them, either unwilling or unable to make the transition. By that point, though, he’s already had his first brush with Peppy Miller (Bérénice Bejo), a girl he literally bumps into outside a premiere; suddenly she’s an overnight sensation but he risks being left behind. Despite that, there’s an undeniable chemistry between George and Peppy, even though George is thoroughly domesticated, with both a wife and a dog at home. The distinction to be made with The Artist is that it’s not a film made exactly to mirror the silent films of the Twenties, not least because the advent of sound happens fairly early on in the narrative. While it’s black and white, largely (though not completely) silent and filmed in narrowscreen, it has the unmistakeable gloss and sheen of a film made with 21st century techniques. The cinematography is crisp, the soundtrack is much more in the style of a modern orchestral soundtrack and it’s a film filled with characters in close-up; widescreen was designed to capture epic vistas and sweeping scenery, and The Artist is an intimate story of people and relationships, ideally suited to the smaller screen width. (See it on a big enough screen, of course, and it’ll make little difference). The tricks and the effects are to pay homage to the films of the time, not to slavishly copy them, and there’s a number of very clever sequences which subvert expectations and use the throwback effects, especially the sound, to wonderful comic and dramatic effect. It helps that the quality of the performances across the board is also impeccable. Carrying most of the meat of the film between them are a central trio formed of Dujardin, Bejo and a canine co-star who steals practically every scene he’s in. Dujardin has the perfect matinee idol look and is as comfortable with his anger as he is his charm; you could imagine Clark Gable having taken on the role if the film had been made eighty years or so earlier. Bejo is full of charm and charisma and it’s easy to see why George is so easily smitten, and the pair make a timeless couple. If there’s one thing that the casual viewer will end up remembering long after the viewing, though, it’s Uggie the dog, who’s even been on a promotional tour for the film, and his tricks and his faithfulness should melt the hardest of hearts. The cast is filled out by a cast of familiar American faces, notably John Goodman and James Cromwell, but none of them would look out of place in a film from an earlier era. What has always been hard to conjure in cinema, regardless of the tools and techniques used to make it, is a quality almost indescribable; it’s a magical tone when performances, script and direction work in such harmony as to transport the viewer completely into the world of the film. Many films have endured even though their techniques have long since passed out of regular use, mostly because they have captured that quality. If you look at the Internet Movie Database’s top 250 films, nine of them are silent films, but eighty-nine have some black and white element; it’s actually more of a wonder that anyone made such a fuss. If only those Scousers who walked out had given the film more of a chance, because one of the films that already falls into both categories in the Top 250 is this one. It has that magic, and what Michel Hazanavicius and his cast have conjured up is spellbinding, enchanting and thoroughly deserving of that place on the list. The Artist takes techniques almost as old as cinema itself, and with a sprinkling of post-modern playfulness produces a film which will hopefully be entrancing audiences long after the current innovations have also passed into history. Why see it at the cinema: This is a film that this blog was made for. Find the best cinema you can, see this at the busiest time possible, and get lost in the magic of cinema. This entry was posted in Reviews and tagged Bérénice Bejo, black and white, comedy, Jean Dujardin, John Goodman, Michel Hazanavicius, romance, silent film.